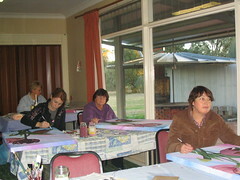 I took these photos during the workshops at Rosewood. I had a wonderful time teaching everybody. I haven’t included names but if you’re in these photos, please add a comment! The tracing. Download the file here. It’s currently A4 size, so you will need to enlarge it to A3 and print it out onto tracing paper. If your printer doesn’t do sizes larger than A4, take it to a print and copy centre such as Kinkos - they should be able to enlarge it and print it onto tracing paper. Both are PDF documents so you will need a reader such as Adobe Reader in order to view them. 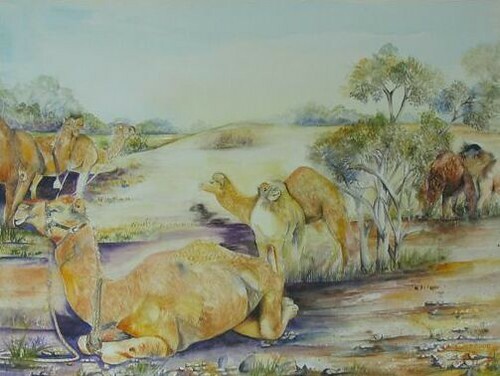 Here’s my latest watercolour of camels. 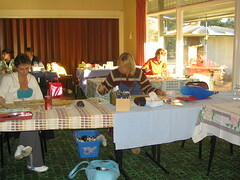 I am working on another at the moment. I like to think that everyone can be successful when they start to paint with watercolours, so I introduce art masking fluid with the first painting. There is a school of thought that one should never use masking fluid - that you should be able to introduce light in to a painting with out it. But you know what? 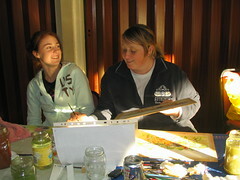 If you are successful with your first painting you are likely to want to continue. Art masking fluid is a rubber latex solution. It is used to mask out an area you do not wish to paint. For instance, if you would like to paint a rose you would either trace or sketch the rose, then you would carefully block it in with the masking fluid, making sure the paper is covered well. If you can see the paper through the masking fluid, then you will need to add another coat. Allow it to dry before you apply the required washes over the paper for the background. Masking fluid can be used before any painting has been done - this will ensure that any highlights can be kept white. Masking Fluid is available in a clear or slightly yellow tint and I have even seen it in a blue colour. 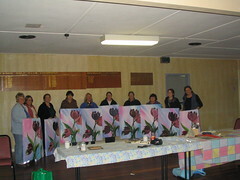 It can also be introduced at any stage of the painting - providing the surface is thoroughly dry before it is applied. I like to use the brand Art Spectrum which has a yellow tint to it this makes it easier to see when applying it. Of course, you can buy other good brands of masking fluid at your favourite supplier. Don’t use your good brushes when applying the masking fluid, but use a brush with a good point. Continually condition your brush with liquid detergent before you dip it in the fluid as it is inclined to clog the brush. I like to paint over the sketch lines as I find the masking fluid will remove them. It is important that the masking fluid is dry before you remove it - even when it’s dry it will have a wet sticky look so touch it with the tip of your finger to check. Gently rub away the masking fluid with a clean fingertip or an eraser. Masking fluid can also be used for textured effects and splattering - the list goes on and on there is just so much for you to learn, it is so exciting. I think I will leave that for when we are actually painting a project together. Watercolour papers are offered in a perplexing variety of sizes, weights, textures and prices. There are a number of good quality brands available. I mostly use Arches, however Whatman, Fabriano, Saunders Waterford and so on are all very good papers. I think you should experiment yourself, as it depends on what you are going to paint. You will find that professional-quality watercolour paper is expensive, but I think it is certainly worth it. Watercolour paper comes in a variety of surfaces so you should choose the right surface. Rough paper has the most ‘tooth’ - ridges on the paper - and if I am painting landscapes, this is the paper I use. For instance, if I am painting water I will use the side of my brush. The paint then adheres to the elevations and will leave sparkles on the surface of the water. However, like everything it takes practice to achieve this effect. I use hot-pressed paper if I am painting fine detailed work as it has a smooth surface. Cold-pressed is ideal for beginners as it has enough tooth for repeated washes but it’s texture will still allow you to create sparkle in your painting. I mostly use cold-pressed paper. Then there’s the weight of the paper. I mostly use 300 gsm; professional watercolour paper can come in different weights, as little as 70 or 90 gsm. I have found, though, that the lighter the paper the more you are likely to have trouble with it warping if you are new to painting. The weight is determined by a ream which is usually 500 sheets. A standard size sheet of paper is 22 x 30 inches. I could write pages about paper! I haven’t even got into stretching the paper or anything like that. Sometimes the best way to learn is to try it out and if you have any questions, feel free to leave a comment here.